Thanks to Arnold and a few other pioneers in N scale they kept the N scale arm of model railroading going that helped us get to where we are today. Maybe not the quality we have today. But you have to admit they had some very unique items in the day. So lets ee what you have! Below is an Arnold GP9. LOL! Looks crude to today's standards but,back in the day I thought those were tops and had 2 of them in '69/70.Your picture brings back memories of my early "sneak about" N Scale modeling. Indeed where would N be today wasn't for those models? She still runs although I keep her in a display case now. 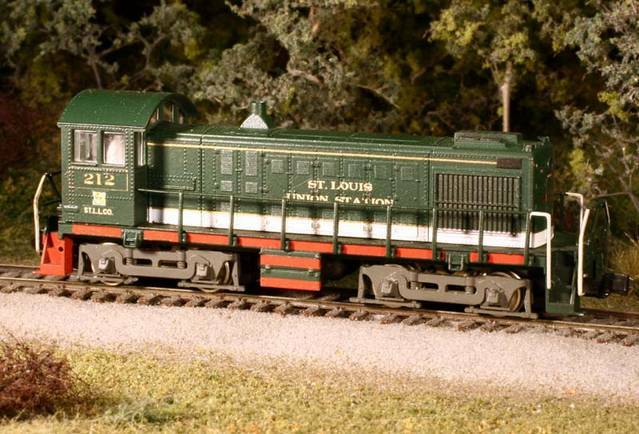 This is the locomotive that started me off on small steam in N scale and the logging layouts. The Arnold 0-6-0 is a very old design, going back to about '68. MT made a pilot conversion to make it into a 2-6-0. That's as close as I could get in '76 to my HVRR #5. It was repowered with a Trix U28 motor, tender trucks were swapped out twice (first time with MT trucks, second time with Kato tender trucks for pickup). The stack mod was a wood dowel turned and jammed in the brass screw stack. 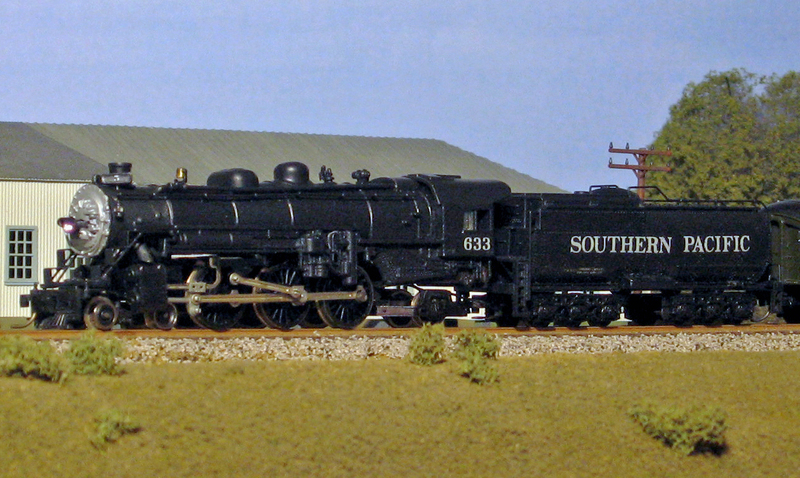 It was just 'retired' last month when I finished the new scratchbuilt 2-6-0, but it is still very much operational today. Great performer, actually, particularly after I put on the Kato tender truck pickups. One of the biggest problems with the new locomotive was getting it to run as well as this one did. Arnold Rapido steam crane, heavily modified and rarely operated. rome91, Kurt Moose and SD35 like this. Of course there was the old Arnold 4-6-2 that I had a bunch of. Most all have been heavily kit bashed. rome91 and Kurt Moose like this. My layout has been “down” two or three years, but when I was operating, I was regularly using an Arnold Rapido GP-7 which I had painfully repainted in Santa Fe zebra stripes. Here the local is taking a break from switching Johnston and the crew is heading into the “railroad men’s back fence cut through” into Lumberjack Cookhouse, a favorite spot for lunch. 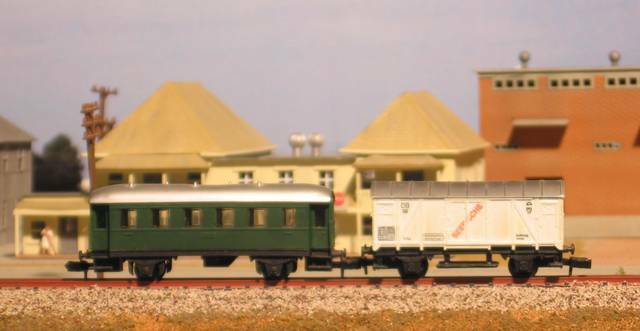 I have four Arnold Rapido boxcars, none with what I consider correct marking for my layout. 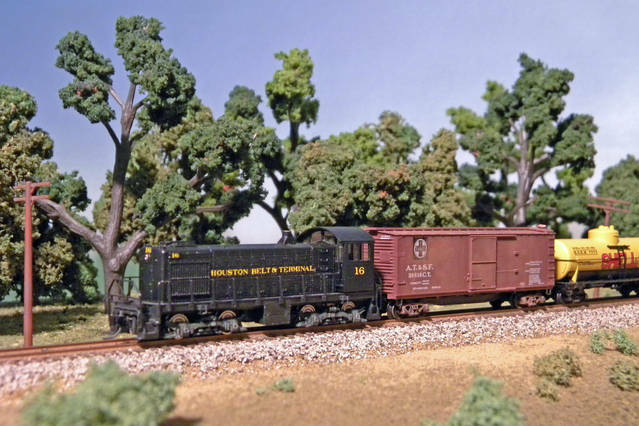 Two Santa Fe boxcars with the general appearance of 40’ steel AARs have the big billboard Santa Fe circle-cross which is too late for the 1955-1957 time frame of my layout. My notes show that a boxcar painted as PRR #39857 is not correct for PRR. However, it is a single-sheathed wood Howe truss alternate-ARA design which would be good if I can find correct decals and information. I have one Rapido boxcar with Santa Fe markings stamped onto a translucent red “plasticy” looking body with a sheet metal underframe, which I keep as an “artifact” of early N scale. 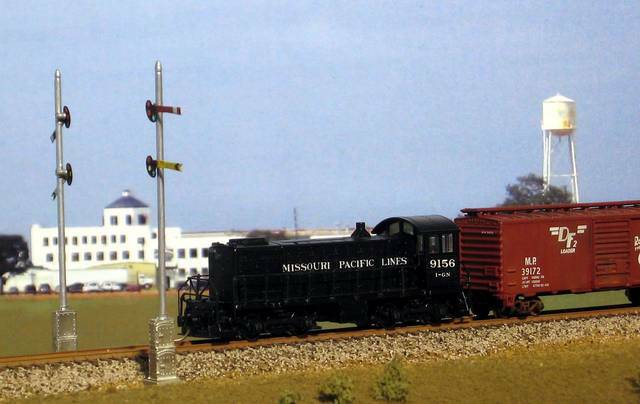 Two Arnold Rapido 2-bay covered hoppers are in service as Santa Fe GA-52s. It was a job to replace the old Rapido truck-mounted couplers with MTL trucks and couplers. I had to grind off the metal posts that held the Rapido trucks, replace them with QualityCraft bolsters (I think I have used my last set- hope I can find some more...) to mount MTL trucks w couplers. Here, the Rapido LOs are in a string of covered hoppers in the main body of a local train on the main at Johnston while the locomotive switches a Santa Fe class FT-T flatcar of tractors to Wayne Implement. 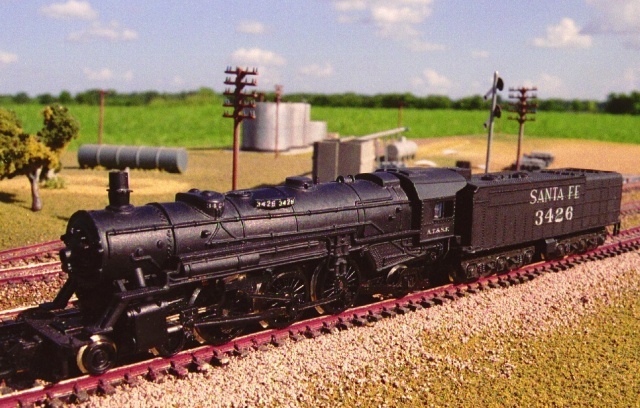 The Conoco bulk dealer at the right edge of the photo is a scratchbuilt copy from a prototype at Sealy, Texas. I have two Rapido 40’ flatcars. Forty footers are HARD to find. I may use one as the underframe of a Santa Fe sulphur gondola. (I want a fleet of at least 6 or 8 to serve my version of Galveston.) The other is a work flat with a jib crane, lettered for UP. I’m hoping I can find a plausible ATSF prototype. My three Arnold Rapido war emergency gondolas are a must-keep for my layout. Only one is converted to MTLs with a body mount- and it needs repair! 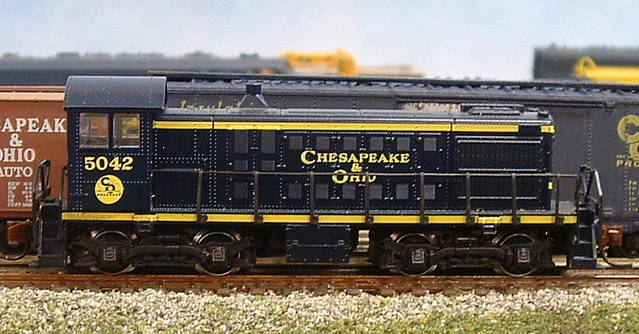 An Arnold Rapido old wood caboose is lettered ATSF but I can’t find at ATSF prototype. But it is interesting. Wonder in what role what it will end up. And of course, I have two 60 foot streamlined RPOs to run on my Texas Chief trains. So Arnold Rapido is still around for me, albeit as a small presence. Not exactly "classic" Arnold, as this was a new for 2010 release, but I believe that this is the only Arnold that I own. About the only thing I did with this old locomotive was to fill the gaping hole in the pilot. These old Arnolds sure made a lot of noise but they could pull. Who can forget the fine Arnold GG1? I didn't know these were AR. I have a few of them. Couplers are body mounted here. Actually the others were Bachmann or Atlas Austria, not AR. The looked similar. r_i_straw, does that old "Baldwin" still run? I bought one years ago out of curiosity. Very primitive mechanism. I have two S-2's. One will be NYC, one probably FJ&G. r_i_straw, does that old "Baldwin" still run? Yup. I call it old Sparky. It has two speeds, stop and warp. It leaves a large cloud of ozone behind wherever it goes. Here is my S4 in progress. This Grafton & Upton S4 was build using the trucks from an Arnold SW1200 mounted under the Standard Arnold S2. The only modifications needed was the removal of the brake cylinder from the AAR-A trucks. I replaced the wheels and gears with parts from NWSL. The motor is a Faulhaber coreless repower kit. The paint is Tamiya and the decals are custom. It is easilly one of the best running engines in my fleet and very quiet. Its amazing what a few new gears a a high quality motor can do.